University of Newcastle (UON) Professor Philip Morgan's highly successful obesity prevention program Healthy Dads, Healthy Kids (HDHKTM) has received global recognition for excellence and leadership in promoting health and well-being in the community. The world-first program, that encourages dads to become family role models and spend quality time with their children using exercise and healthy eating as the engagement medium, was awarded the Excellence in Obesity Prevention Award from the World Health Organization (WHO) Collaborating Centre for Obesity Prevention in Australia. HDHK is a partnership between Coal & Allied, Hunter Medical Research Institute, Hunter New England Health, the University of Newcastle and the community. Co-Director of UON's Priority Research Centre in Physical Activity and Nutrition and a Professor in the School of Education, Professor Morgan said obesity in men, and prevention of obesity in children, were international public health priorities. "Fathers have a major influence in the physical, social and emotional development of their children," Professor Morgan said. "Healthy Dads, Healthy Kids aims to help fathers achieve a healthy weight, and improve the activity and eating behaviours of their children. Making physical activity fun, and part of father-child interaction, is key to the project. At the same time, we are inspiring children to act as 'personal trainers' for their dads and support them by role modelling healthy lifestyles to their dads." Leading Australian obesity experts judged the university and community-based initiatives vying for the Excellence in Obesity Prevention Award on community engagement; program design and planning; evaluation; implementation and sustainability; governance and transparency. "Healthy Dads, Healthy Kids has been delivered by trained facilitators across a number of local government areas in NSW, and we've seen significant improvements in a host of physical and mental health outcomes in both children and fathers. A bonus benefit of the program has included increased happiness and bonding within participating families," Professor Morgan said. Coal & Allied Community Relations Manager Shannon Garcia, said they were pleased the Healthy Dads, Healthy Kids program was making a positive difference to the quality of life for many fathers and families. "Since 2009, Coal & Allied has provided support to convert the University of Newcastle's research into a community-owned model and ensure its sustainability by funding locals to gain the skills and knowledge to assist in the ongoing facilitation of the program," Ms Garcia said. "We are encouraged to see our investment of almost $600,000 through the Coal and Allied Community Development Fund has contributed to providing a sustainable program that delivers real results for our Upper Hunter Valley communities. We hope the success of the program and global recognition from this award will inspire dads and their families in every community to continue to take their health and well-being seriously." 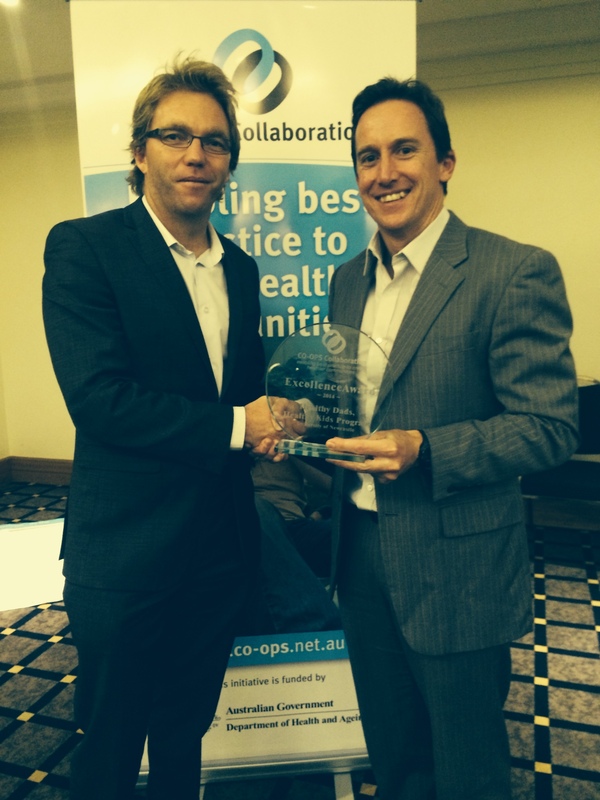 The award was presented at the 2014 Collaboration of Community-based Obesity Prevention (CO-OPS) National Workshop at Stamford Plaza, Adelaide on Monday 12 May. In 2010 Healthy Dads, Healthy Kids was awarded first place in the category of Public Health and Policy at the International Congress of Obesity in Stockholm, Sweden. In 2009 Sports Medicine Australia recognised the program with the prestigious ASICS medal, naming it the best research project at its national conference. For interviews with Professor Philip Morgan, contact Media and Public Relations, on 02 4921 5577 or media@newcastle.edu.au. +6 1 2 4921 5555.